Almighty God comparing the Church of the Jews with a vineyard, expostulated with them thus: what should I do more to my vineyard, then I have done? and yet instead of yielding me good and sweet grapes, they yield me such as be wild & sour, such as are enough to set a mans teeth on edge. 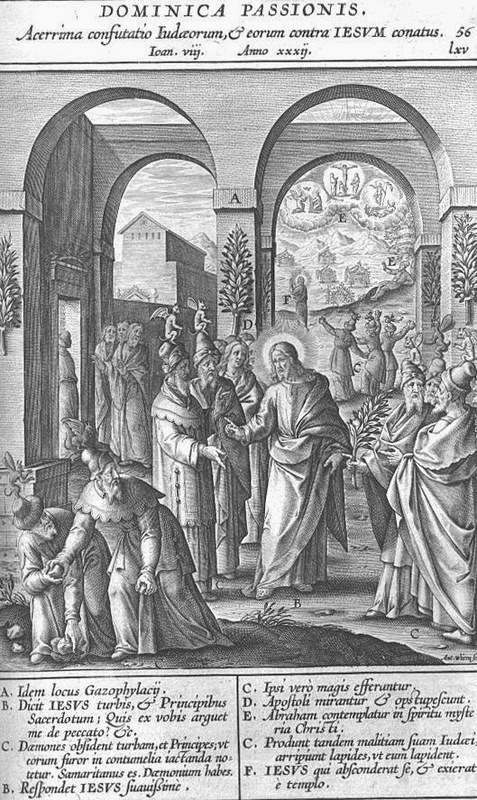 So might Christ have expostulated with these scribes and pharisees, For what could he have done more, then he did for their conversion & amendment of their life, not only here, but diverse times before, not only by evident and plain doctrine, convincing them by force of argument: but even by miraculous cures, curing of all manner of diseases, and other plain signs & miracles indeed? and yet instead of their conversion, & instead of good grapes, they yield him harsh and sour grapes of calumniation, & blasphemy, saying he was a Samaritan, that is to say a Schismatic in religion, & had a devil & took up stones to cast at him, & had stoned him to death, had he not escaped from them by a miracle, which was enough to have made them desist and relent, if there had been nothing else; but they would not. These were wild and harsh grapes, enough to have set any mans teeth on edge, to have retorted the like upon them, that had been a mere man, and not God, and man, as Christ was. But what did he? He would not do so, he only made them this null answer: I have not a devil. I seek not mine own glory, there is one, to wit, my father, that doth, & will judge. These were his words, which in deed he spake not so much for the Scribes and Pharisees: (For he knew them not to be of God, and therefore would not hear his doctrine, but be the more exaggerated against him) but for us, and our instruction, giving us a singular example of most high & heroic patience it being, if not one of the most necessary virtues that is. Many virtues there are that are not absolutely necessary to salvation: nor are all virtues necessary to all persons alike: but patience is. Patience, saith St. Paul writing to the Hebrews or Jews, is necessary for you, that doing the will of God, you may carry away the promise, to wit the promise of God of everlasting salvation. St. Cyprian being to make a Sermon of the virtue of patience, began thus: patience is so universal and necessary a virtue, that I being to preach toy of patience, unless you have patience with me, you cannot hear me, nor I preach. In all tribulations and adversities there are three degrees of taking them: the first is to rejoice, as the Apostles did, & as they do that are perfect; the next, if we cannot arrive so high, as to rejoice, to think it a thing at least worthy to be rejoiced at, as St. James exhorted; if we cannot arrive to that degree neither, yet patience at least is absolutely necessary for us, as is aforesaid: in patience or by patience, saith Christ; you shall possess your souls, for without patience you cannot do the will of God in hope, & expectation of everlasting life, which God promotes to them that love and serve him. And in these words, In your patience you shall possess your souls, is also signified what our patience must be, it must not be in our tongue & hands only (though that be good, and more then we can easily perform) but it must be in our souls: it is not said, we, must possess our hands or tongues in patience, but our very souls: as no doubt Christ did here. And then we shall easily possess our hands & tongues. And one strong motive to labor to procure it, besides the necessity thereof, is, to consider in this life, though it were death itself, we suffer but as the good thief did upon the cross, with Christ: to wit, for our just desert, (as he said he did) at least at the hands of God. And Christ hath taught us to ask remission of our own sins, but as we forgive others, and that from the bottom of our hearts. Behold now whether we must not possess our very should in patience, if we will possess them at all; and not our hands and tongues only.